A Chinese Long March 3B rocket lifted a French-built communications payload into orbit Saturday to broadcast television signals, Internet access and network data solutions across the Asia-Pacific and the Middle East for a Hong Kong-based satellite operator. Artist's concept of Apstar 7 and a diagram of the Long March launch sequence. Credit: Thales Alenia Space/China Great Wall Industry Corp. The launch occurred at 1027 GMT (6:27 a.m. EDT) from the Xichang space base, a facility in Sichuan province in southwest China. The blastoff was at 6:27 p.m. Beijing time. The 180-foot-tall Long March 3B rocket, featuring an enhanced first stage and strap-on boosters to haul heavier payloads into space, soared into a mostly cloudy sky and flew east from Xichang. Two burns of the Long March 3B rocket's cryogenic third stage injected the Apstar 7 satellite into an elliptical orbit with a high point of 31,145 miles, a low point of 148 miles, and an inclination of 27.4 degrees, according to U.S. military tracking data. The third stage released the Apstar payload about 25 minutes, 42 seconds after liftoff. Apstar 7 weighed 11,142 pounds at the time of launch. The satellite will use an on-board engine to circularize its orbit 22,300 miles over the equator, where it will be positioned at 76.5 degrees east longitude and enter service for APT Satellite Co. Ltd. of Hong Kong. 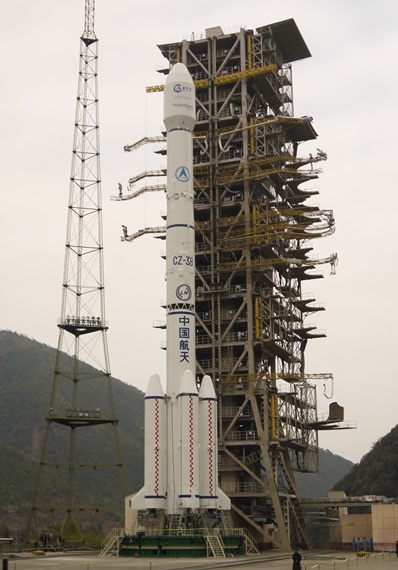 The Long March 3B rocket before liftoff. Credit: China Great Wall Industry Corp. APT arranged the launch under a commercial agreement with China Great Wall Industry Corp., a state-owned launch services firm. 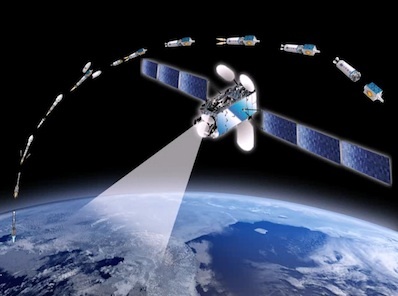 The satellite is outfitted with 28 C-band and 28 Ku-band transponders to serve China, the Middle East, South Asia, Africa, Australia, and part of Europe. Apstar 7 will broadcast television programming, facilitate corporate data networks, and serve Internet users during its 15-year design life. Apstar 7 was built by Thales Alenia Space of France using an 'ITAR-free' version of the company's Spacebus 4000 C2 satellite platform. Thales avoids U.S. government regulations by not using U.S. satellite components in its ITAR-free satellites. The International Traffic in Arms Regulations, or ITAR, classifies U.S. satellite parts as munitions, preventing their launch on Chinese rockets. Apstar 7 will replace the Apstar 2R spacecraft, which is near the end of its design life. Saturday's mission marked the fourth Chinese space launch of the year.